A unique and critically acclaimed book looks at the greatest UFC champions and super stars of the fastest growing sport in the world. In less than a decade, the sport of mixed martial arts (MMA) went from a novelty spectacle to a worldwide phenomenon. The sport of mixed martial arts has penetrated the defence of the mainstream media where it’s outselling boxing, pro wrestling and any other combat sport. This riveting and fascinating book explores the lives and careers of the toughest fighters ever to have stepped into the Ultimate Fighting Championship arena. Within the pages of this tome for the first time is a compilation of exclusive interviews with the greatest UFC champions and superstars. In their own words the hardest athletes in the world tell their stories, the obstacles and hardships they have had to endure, giving us a rare insight into the lives and careers of the titans who have propelled the sport into the big time, making it the fastest growing sport in the world. The UFC broke the pay-per-view industry’s all time records for a single year’s business. What the UFC is doing – and what the WWE and boxing haven’t done – is create new stars. Major MMA shows attract a galaxy of celebrities from the Film, T.V and sports world. In U.SA and Japan MMA has climbed to celestial heights with regular attendances in excess of 20,000 to 100,000. In the U.K the UFC is outselling fights headlined by the most popular boxers in the country. This book charts the radically diverse backgrounds of the fighters, from the legendary pioneers and UFC Hall of Famers Royce Gracie, Ken Shamrock, Mark Coleman, to iconic fighters and champions Randy Couture, Chuck Liddell, Matt Hughes and the controversial charismatic star “The Huntington Beach Bad Boy” Tito Ortiz, finally moving on to rising stars Michael Bisping and Georges St Pierre. 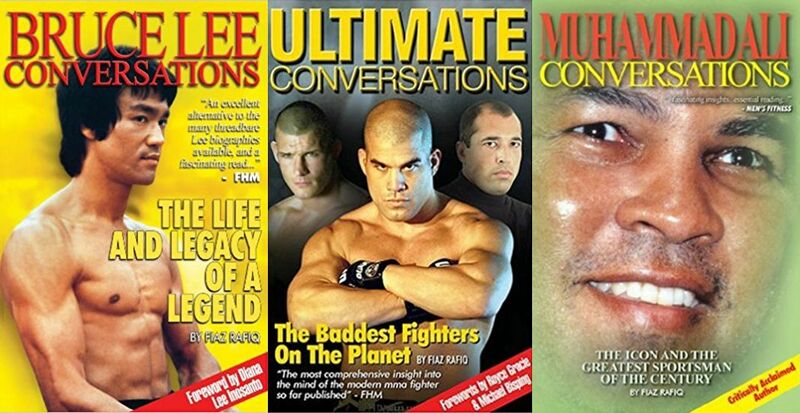 Ultimate Conversations gives you an incredible glimpse into just what it takes to survive in the world’s most brutal arena in the most popular and exciting combat sport on the planet. Fiaz Rafiq is a major columnist for a leading bestselling martial arts magazine, ‘Martial Arts Illustrated’ and a contributor to ‘Impact- The Global Action Entertainment Magazine’. His work has appeared in combat sports magazines in the US, UK, Australia, Germany and France. Bruce Lee belongs in the top echelon of influential stars and iconic figures in the world. More than 35 years after his death, he remains a perennial bestseller in video stores, comic book shops, on T-shirts and posters. He influenced pop culture more than anyone, before or ever since. Time magazine named Bruce Lee as one of history’s most influential people. 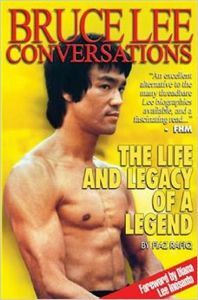 At last, in this thought provoking, compelling, unique and intriguing landmark book you will discover a compilation of over 50 exclusive interviews with Bruce Lee’s original students, friends, co-stars and colleagues. Those who knew him best give their candid views on the greatest martial arts master and action movie star adored by millions around the globe.Furthermore, for the first time ever, you will discover exclusive interviews with some of the best professional boxers, bodybuilders, UFC fighters and personalities from the motion picture industry paying homage to the legend who continues to have an indelible impact on millions of people from all walks of life around the globe. This is a must have book. Muhammad Ali is one of the most remarkable sports personalities and celebrities of our time. He is a legend who transcended boxing and rose above all sport. A man of mythic proportions, Ali has been such a prominent feature of our cultural landscape. Nicknamed “The Greatest”, Ali was crowned Sportsman of the Century and also Sports Personality of the Century. Alongside the late Bruce Lee, Ali is acknowledged as the most famous face in the world.In this uniquely compiled biography, many of the prominent figures in Ali’s life culminate on many facets of his life. Through exclusive accounts of family members, close friends, associates and adversaries, the result is compelling and full of intriguing insights into a sporting legend.Muhammad Ali’s story is an epic one, one of bravery, courage, hope, abundance and overcoming difficult obstacles with an indomitable will. 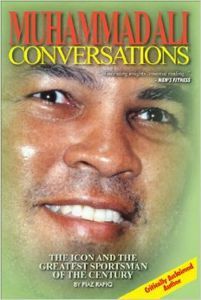 Muhammad Ali: Conversations is the ultimate tribute to one of the greatest icons of the century.